This beautiful choice board is PERRRFECCTTTT for helping our students identify effective tools that will assist them in regulating their emotions! This is a full page version, but if you check out the product listing on TpT, you'll see that there's also a half-page version (of which you can also resize using your printer settings!) if you need something a bit smaller. 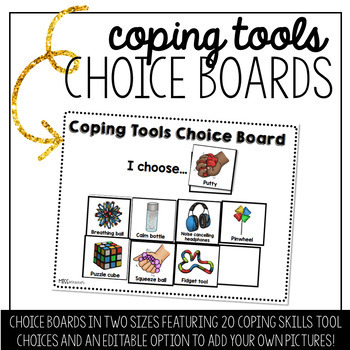 It offers space for 8 pictures of coping tools that you can determine based on student needs and availability. After you laminate and velcro-up the board, you will have 20 pictures to choose from already available to you (a wide variety of tools!) and an editable page where you can add in real photos of unique tools you have available in your school or home setting, if you're a parent/guardian looking to use this in your home. The supplies I use to create these boards are all linked below.